October 6-12th, 2013 was National Fire Prevention Week, organized by the National Fire Protection Administration (NFPA). Visit their website for additional information and resources. So, obviously, the whole point of National Fire Prevention Week is to keep dangerous fires from starting in the first place. But sometimes, despite all our good efforts, things go wrong. In addition to knowing effective practices for fire prevention, we need to be prepared for the other contingency. In this case, that means having a current fire escape plan in place and making sure everyone in your house knows what to do in the event of a house fire. "There is little time! In less than 30 seconds a small flame can get completely out of control and turn into a major fire. It only takes minutes for thick black smoke to fill a house or for it to be engulfed in flames. Most deadly fires occur in the home when people are asleep. If you wake up to a fire, you won't have time to grab valuables because fire spreads too quickly and the smoke is too thick. There is only time to escape." "Heat is more threatening than flames. A fire's heat alone can kill. Room temperatures in a fire can be 100 degrees at floor level and rise to 600 degrees at eye level. Inhaling this super-hot air will scorch your lungs. This heat can melt clothes to your skin. In five minutes, a room can get so hot that everything in it ignites at once: this is called flashover." "Fire isn't bright; it's pitch black. Fire starts bright, but quickly produces black smoke and complete darkness. If you wake up to a fire you may be blinded, disoriented and unable to find your way around the home you've lived in for years." "Smoke and toxic gases kill more people than flames do. Fire uses up the oxygen you need and produces smoke and poisonous gases that kill. Breathing even small amounts of smoke and toxic gases can make you drowsy, disoriented and short of breath. The odorless, colorless fumes can lull you into a deep sleep before the flames reach your door. You may not wake up in time to escape." •	Make sure every room has two escape routes. •	Keep fire escape ladders in upstairs rooms in case the stairs are blocked and the window is your only way out. Emergency Essentials sells a Fire Alert Fire Escape Ladder that you can your family can practice using during your fire escape drills. •	Teach children how to open windows and remove screens quickly. •	Practice every escape route blindfolded (smoke can be disorienting), crawling on the floor (smoke rises), and as fast as you can (fire spreads quickly). •	Teach children to check doors for heat and smoke before they open them. If either is present, leave it closed and use the secondary route out of the room. •	Never forget what you learned in elementary school: if your clothes catch fire, stop, drop, and roll! •	Get good quality smoke detectors and carbon monoxide detectors for each bedroom and one for each level of the house, including the basement. Remember to keep fresh batteries for them. If you missed National Fire Prevention Week, now is the perfect time to get your fire escape plan in place, with plenty of time to practice it before the end of the year! 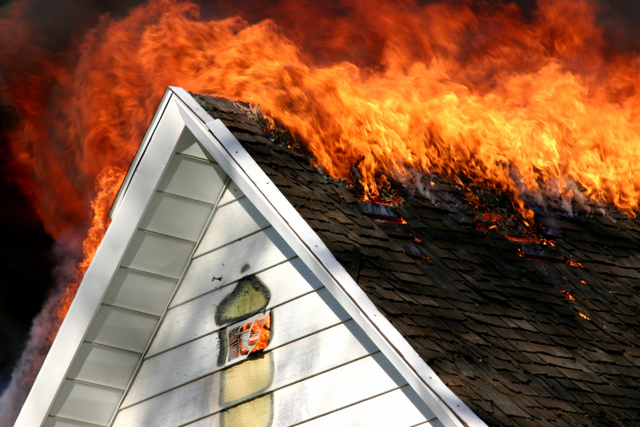 "It's National Fire Prevention Week"
This article is sponsored by Emergency Essentials.